Translating discoveries from bench to bedside is a challenging process and allows us do advance scientific discoveries and ensures that government-funded research translates into improved health for our society. The SPARK training program helps to understand clinical needs, develops a target product profile and strengthens project management abilities. These essential tools not only increase the likelihood of success, but also help decrease both the cost and time required to accomplish this goal (“de-risking”). 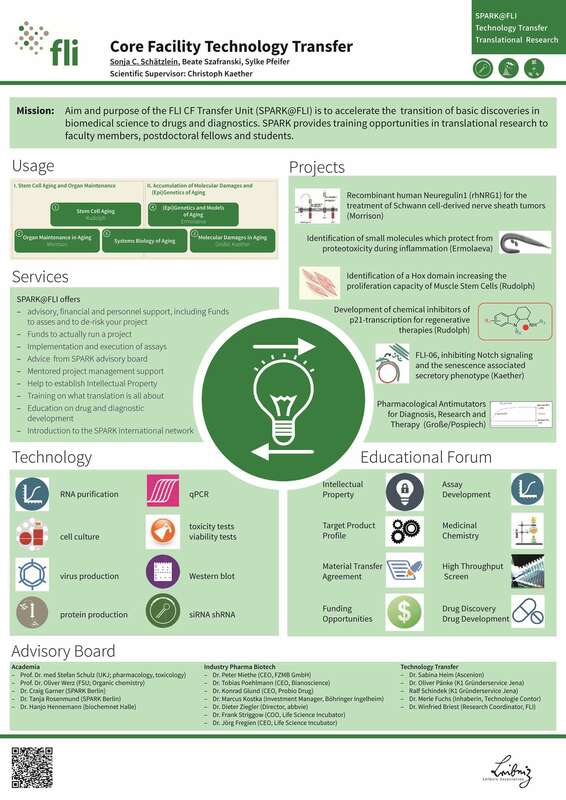 The Transfer Unit supports research labs to develop small molecules or biologicals or treatments of unmet clinical needs, respectively, with the aim to advance projects for any indication with high potential impact. To achieve this goal we utilize a variety of molecular and cell based techniques as well as different animal models. If you're interested in recent keynote speech "Reproducibility crisis in Academia" by Ulrich Dirnagl (Charite Berlin), you can watch it here or download it [pdf, 5MB]. The first call for projects has been placed, please contact S. Schaetzlein for further information (Submission deadline was February 15th 2016). This program is based on the highly successful “SPARK” program developed at Stanford University. See also the “SPARK Info Packet" (pdf). A free sample of the published book, “SPARK: A Practical Guide to Drug Development in Academia”, by Daria Mochly-Rosen and Kevin Grimes will be given to our SPARKees. Download (pdf) "SPARK Info Packet"
Please inquire – guest contract may be necessary.